Thank you for the blog hop invite. I have linked up. I am looking forward to connecting with you as well as other bloggers in the hop. Easy, FOR SURE! I have chocolate protein powder that I just mix a little water into = DONE = chocolate pudding! LOL! Good lord, that IS easy!! We will make it today! My son is a chocolate junkie!!! Thanks for sharing this recipe. I'm going to try a homemade Lemon pudding recipe today! Lemon pudding sounds yummy! I love lemon! Oh I am going to try these recipes, look so delicious and my kids would really enjoy making this! Nice to be able to make it from ingredients already in the house instead of the prepackaged stuff...and that way you know what's in it! Sounds delicious! I love chocolate. Thanks for linking up to Sweet and Savoury Sunday, stop by and link up again. Have a great weekend!! Looks yummy! Thanks for sharing! Love pudding this time of year! Looks yummy, thank you for sharing on the first "Stumble Into The Weekend" !! You mean you can make pudding without a Jello box? Sounds wonderful! You can't go wrong with pudding for dessert. I love your recipe. I love pudding and this looks really good. Yum...saving this, it is the recipe my grandmother used to make for us when we were kids. It is so much better than boxed stuff. 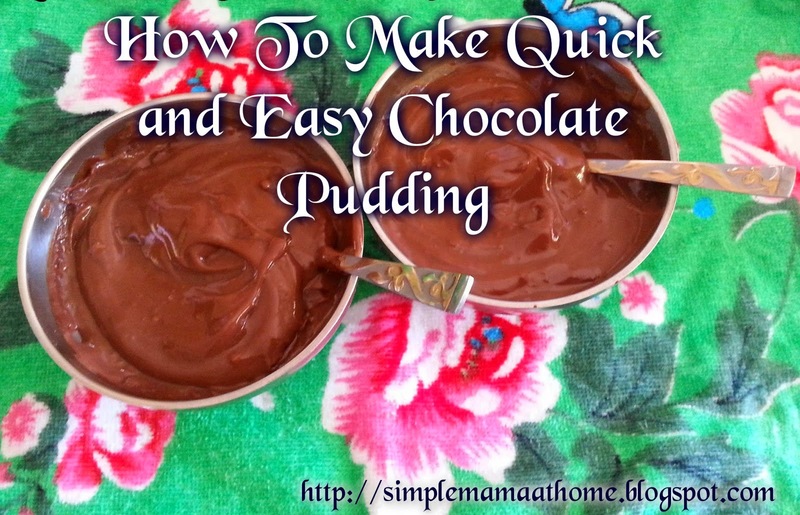 Can't beat "chocolate" and "easy" in the same sentence!! Can't wait to try this! Do you think I could make this with a soy or almond milk? It sounds great but we're a dairy-free house. I can't see any reason why it wouldn't work. The milk I used was regular full fat which resulted in a thick pudding. I am not sure if soy and almond milk are available in full fat. I know that if you use a milk with low fat the pudding will still come out fine and be tasty only may not be as thick. If you do try it please let me know the result. All the best. You have my word that this pudding is worth making.